The telecom supply chain is quite complex and requires interoperability across vendors and system architectures to provide effective and efficient communications services. Consumer interests and demands result in frequent changes to the hardware, software and service infrastructure. This results in migration to new services, oversight from the various public regulators and special tax rules that ensure some parts of the network have a long service life. Because this industry sector requires more than the generic ISO 9001 for its quality management system (QMS) to satisfy these demands, telecom companies use TL 9000 to improve quality and reliability of services and products across the supply chain. Quality Excellence for Suppliers of Telecommunications (QuEST) Forum is the only worldwide forum for quality of these products and services. The QuEST Forum sought to develop and maintain a single, common set of worldwide telecom QMS requirements and measurements built on existing industry standards and practices. QuEST is composed of the leading telecom manufacturers and service providers and is the standards development organization that maintains TL 9000 handbooks on requirements and measurements for the worldwide telecom industry. The QuEST Forum strategy is to build TL 9000 on top of the ISO 9001 requirements, allowing existing certification and accreditation bodies to easily accommodate TL 9000 audits, training and certification within their conformity assessment infrastructures. Shortly after the International Organization for Standardization (ISO) released ISO 9001:2000, QuEST issued TL 9000 QMS Requirements, release 3.0, with 81 adders. TL 9000 has been deployed to almost 1,000 organizations in more than 1,500 locations in more than 50 countries. Five years later, in June 2006, TL 9000 QMS Requirements release 4.04 was issued. · Evaluate and analyze the adders to make recommendations of areas in which opportunities exist to improve effectiveness and add value. · Ensure consistency between language and terminology used in ISO 9001 and the TL 9000 handbooks. · Ensure consistent and appropriate use of “shall,” or requirement, statements. · Review adders to determine whether there is a need for a documented procedure or other alternative. · Evaluate and analyze the adders to determine whether additional records need to be specified as evidence of the effectiveness of the QMS. · Reference adders with records to ISO 9001 clause 4.2.4. · Reference adders with records to key performance measures or business indicators to help clarify value. · Include examples as notes following the adders. · Substitute some means of measuring effectiveness and continual improvement (such as an additional requirement for records) when documented procedures are removed from an adder. · Ensure consistency of adders by using a checklist of questions or criteria. ISO 9001 remains the basis for the requirements in release 4.0. 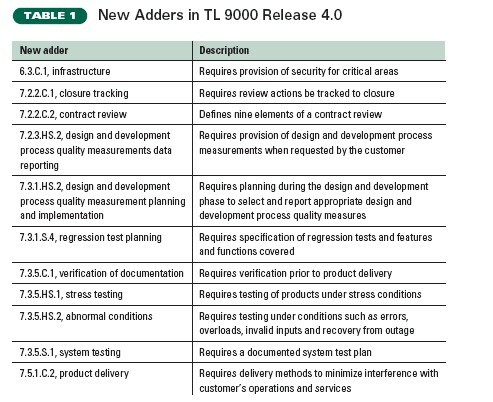 The titles of the adders continue to use the same format: ISO 9001:2000 clause number, scope of coverage and adder numeral. Of the release 3.0 adders, 27 are not changed at all while 24 have minor changes. For example, 6.2.2.C.2, quality improvement concepts, is changed to quality and process improvement concepts. Nine adders have changed scopes, in most cases moving from hardware (H) or software (S) to a common scope (C). For example 7.3.2.S.2, requirements allocation, was changed to 7.3.2.C.3 and is now applicable to all types of products, not just software related ones. Four adders had their numerical designations changed, but the scopes remained the same. As an example, 7.1.C.3, disaster recovery, was changed to 7.1.C.2. This is because the old 7.1.C.2, new product introduction, was deleted. The same is true for 7.5.1.C.2, service resources, because 7.5.1.C.1, organization’s support program, was deleted. Ten adders have changed procedural requirements regarding whether a documented procedure, a method or a process is required. · Documented procedure: can include processes and methods but must be documented. For example, ISO 9001:2000 requires a documented procedure for document control. · Process: a series of steps and actions transforming inputs to outputs. A process is not always required to be documented. Processes must be controlled. They combine inputs with methods, activities and tasks to produce desired outputs. Processes must be monitored, measured and analyzed (see ISO 9001:2000, 4.1, item e). · Method: Means by which an activity is accomplished, which is not necessarily documented but is demonstrated to be consistent and effective throughout the organization. Effective implementation of a method is demonstrated by the existence of verifiable objective evidence, such as observation or record. · Adder 6.2.2.C.1, internal course development, now requires a method instead of a process. · Adder 7.5.1.V.1, software used in service delivery, changed the requirement from a documented process to a documented procedure. In registration scope, clause 3.1, an organization may consider exclusions for TL 9000 requirements outside of clause 7 if they cannot be applied by the organization and are not part of a process that’s the organization’s responsibility. Control of customer supplied documents and data, 4.2.3.C.1, now includes drawings. Examples are customer site, equipment or circuit board drawings, which now will be stored as hard or electronic copies and controlled in a database or log and are traceable to a job or equipment. Quality and process improvement concepts, adder 6.2.2.C.2, was changed to quality improvement concepts. More important, however, is that employees now must be trained and apply the fundamental concepts of problem solving, continual improvement and customer satisfaction. The word “apply” is the key to this change. Training content, adder 6.2.2.C.6, caused confusion in release 3.0 because of its title, which was changed to hazardous conditions training concepts and was extended to include appropriate protective equipment. Life cycle model, 7.1.C.1, now contains new product introduction requirements because 7.1.C.2, new product introduction, has been deleted from release 4.0. Also, this adder was changed from a guideline to a method. In the revised adder, problem severity, 7.2.3.C.2, certain products can now be excluded from severity level reporting. This affects service organizations more than hardware or software development organizations. Migration planning, 7.3.1.S.2, was renamed 7.3.1.HS.1 and now requires support of the old environment. An added note gives examples of hardware and software environments. Process measurement, adder 8.2.3.C.1, was expanded to include appropriate design process measurements and require performance targets or control limits for key process measurements. Table 1 summarizes the 11 new adders in release 4.0. Release 4.0 was effective June 30, 2006, and release 3.0 or 4.0 may be used by registering or registered organizations until June 30. However, release 4.0 must be in effect no later than April 1 to ensure readiness for registration audits after that date. Organizations should plan to address the changes well in advance of July 1. If you are just starting your QMS development it would be wise to implement the new requirements now. The transition will be best managed as a project. Once an analysis of the required changes is complete, subject matter experts for each affected area can work together to make the changes needed to meet the new requirements. Then, other employees in each affected area should be trained. Finally, an internal audit of the affected areas should be conducted to ensure the changes are effectively implemented and findings closed. 1. The 2007 Telecommunications Industry Review: An Anthology of Market Facts and Forecasts, Insight Research, 2006. 2. TL 9000 Quality Management System, Requirements Handbook, release 3.0, QuEST Forum, 2001, available at www.questforum.org/tl9000/tl_hbks.htm. 3. TL 9000 Quality Management System, Measurements Handbook, release 3.5, QuEST Forum, 2003, available at www.questforum.org/tl9000/tl_hbks.htm. 4. TL 9000 Quality Management System, Requirements Handbook, release 4.0, QuEST Forum, 2006. 5. Public Data Network Reliability Final Report, Network Reliability and Interoperability Council VII, September 2005. 6. In-Process Quality Metrics (IPQM) Generic Requirements—GR-1315-CORE, Telcordia, 1997. 7. Capability Maturity Model for Software, version 1.1, technical report CMU/SEI-93-TR-024, February 1993. SANDFORD LIEBESMAN had more than 30 years of experience in quality at Bell Laboratories, Lucent Technologies and Bellcore (Telcordia). He is an ISO 9000 subject matter expert and author of the books TL 9000, Release 3.0: A Guide to Measuring Excellence in Telecommunications, second edition, and Using ISO 9000 to Improve Business Processes. He is a member of ISO technical committee 176 and the ANSI Z-1 committee on quality assurance and is certified by the RABQSA International as an ISO 9000 and TL 9000 lead auditor. Liebesman was recently named a fellow of ASQ. JOHN WALZ had more than 20 years of experience in quality at AT&T and Lucent Technologies. He is an ISO 9000, TL 9000 and software engineering capability maturity model integrated subject matter expert. Books he wrote include TL 9000 Quality Management Standard for Telecommunications, The ISO 9000 Handbook, fourth edition, Practical CMMI Software Process Documentation—Using IEEE Software Engineering Stan-dards and Practical Support for ISO 9001 Software Project Documentation: Using IEEE Software Engineering Standards. Walz is a member of ISO technical committee 176 and the ANSI Z-1 committee on quality assurance and was recently appointed VP for standards for the IEEE Computer Society.